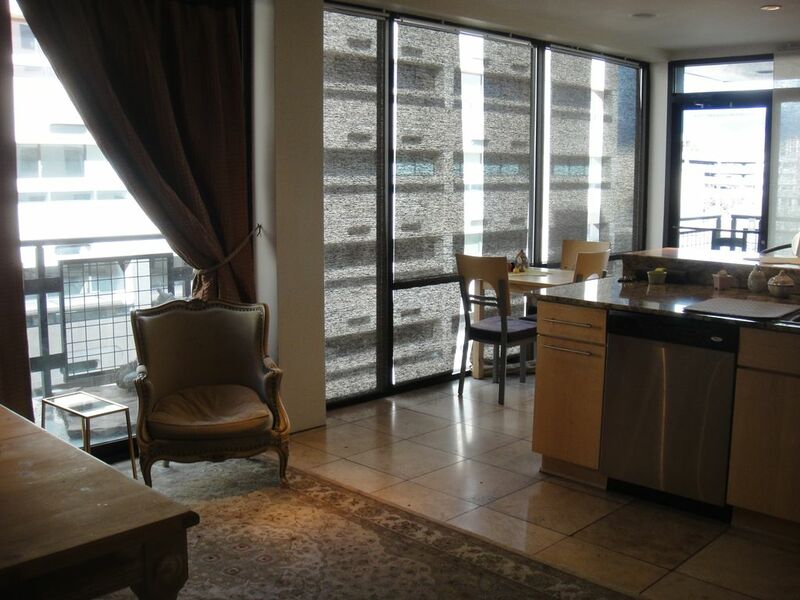 The 1200 square-foot, modern condo has the luxury of a penthouse suite with the connivence of a personal apartment. Nestled between the Hyatt, Double Tree and Andaluz Hotels, the space is a hidden Jem. Travertine floors meet diamond finished walls to create a comfortable, modern environment. However, the condo is accented with Zen influences which provide an open door for relaxation and added comfort to the guests. The kitchen features stainless appliances complete with a coffee maker, juicer, blender, and large counter space. The open kitchen expands into a comfortable living room equipped with a large flat screen TV, DVD player, and cable. The apartment includes free Wi-Fi internet. The kitchen walls include windows with views overlooking Downtown Albuquerque and the Sandia Mountains (which are blue during the day and turn pink at sunset). Privacy and security are a high priority for this property. Private security is a 24-hour service provided by the parking complex. The condo is accessed by elevator with a private fob key also a designated parking space located next to condo entrance. This condo is in a fabulous location. The space is virtually across the street from the Albuquerque Convention Center, Century 14 movie theaters, NM Rail-Runner, Sports and Wellness gym, and a plethora of restaurants. The condo is also located within minutes of Old Town, various art museums/galleries, the Rio Grande Zoo, Botanical Gardens, scenic bike/running trails, and of course, the trendy Nob Hill. If guests are coming from the airport, the condo is about 5 minutes from the Sunport (Albuquerque's airport). The world-famous Balloon Fiesta Park (where hundreds of giant, hot-air balloons launch in October) is also about a 10 minute drive from the condo. The condo is perfectly located and is central to nearly all of the most attractive sites in Albuquerque. Come visit now! I also have a home in Nob Hill. Please visit #571702. Hello and welcome. My name is Betty. My condo is one of the first Downtown Albuquerque Urban Project. My condo is nestled among the hotel district. Each guest stay has given me insight on how to continue improving my location and it's accomodation. I have renovated the condominium and have personally stayed there myself to see what the experience was like. I am constantly evaluating the condo to make the experience the best it can be for future guests. This condo is nestled among the 3 most expensive hotels of Albuquerque's Downtown. The main advantages are that it is close to the same price of a hotel room, but it is 1200 square feet and offers features that a hotel room or suite does not. Parking can be an burdensome expense downtown. The covered parking in this area ranges from $10.00 to $16.00 per day! The condo provides a free covered parking space. This property is zoned as a live/work space. Located on the fourth floor the view of the city mountains to the east and city view of Albuquerque to the South. NE Sandia Mountain is the backdrop to downtown city views. Down Comfortors on all beds. The elevator opens directly to the unit. During your stay you are the only one with a pod which gives you access to the property. Kitchen is stocked with all necessary cooking utensils, spices, and baking utensils. Speakers throughout condo. Google hub. Music channels offered by cable. Zen rock garden and fountain and lounging chair. I really liked the layout for this place, and the urban vibe of it. It's large and well apportioned and thoughtfully decorated... doesn't have that "I'm a rental" sterile feel to it. Everything worked, everything was great and the weekend stay was awesome. An affordable but well kept condo in a convenient location, this had everything I needed and I really enjoyed my stay! This condo was the perfect location for a conference I attended downtown. It was the perfect size for 2 people, and the private elevator entrance was a nice perk. Very close to restaurants and bars, and the two balconies was also a really nice surprise. The name says it all. Fabulous modern downtown condo. This condo is very well located, easy access driving or walking to downtown. Small, but exactly perfect for a couple. Private, yet located near everything. We were in town for a concert at the Kiva Room, less than two blocks. The owner was available, helpful and easy to communicate with. Definitely pick this one for a couple getaway in Albuquerque! Great place to stay, once you found gate. Suggestions: let your renters know that when driving up parking garage, at the '4.5 level', as you turn, look to your right and that's the reserved parking, and gate entrance. If that had been stated, we would have saved half hour trying to find entrance in the dark. Even though Betty G. responded promptly to my emails asking for help, another tenant above our suite, heard me, and came down and showed us where gate was located. The place is nicely appointed, and very clean. Really enjoyed the private parking right at the entrance of the suite, and the parking fob, and location. Last suggestion; take out that round table, and the bench from the bedroom. Put in 2 nightstands, with clock, and a flat screen tv. Then you have a real winner. Great time was had by us. Thanks Betty G.
Beautifully appointed & wonderful place to stay. Better than expected! This is a beautiful, modern condo tucked away in downtown. It is real city living with private elevator access and great parking. And it's in a nice central location in the city. My only regret is that we weren't able to spend more time in the actual property as it's a really nice, upscale and comfortable place with everything you need. My wife and I spent the weekend there for our 25th wedding anniversary to see the International Balloon Fiesta and it was perfect! Thank you Betty! Downtown is a convenient part of Albuquerque, is near a number of exciting activities. Downtown Albuquerque is in a 3 mile radius of Albuquerque's historic Nob Hill. The condo is located across the street from a Sports and Wellness gym (guest passes are available). The Century 14 movie theaters are within 2 blocks of the condo. If the guests are interested in going to Santa Fe, the local train (Rail-Runner) costs only 10 dollars round trip. The station is also located only 3 blocks from the condo. The Rail-Runner goes straight into the heart of Santa Fe Plaza. The condo is in the heart of Albuquerque's night life scene. It is within walking distance of many bars and restaurants.There are various restaurant options including sushi, Italian, French, and traditional New Mexican cuisine. One activity that I find many guests enjoy is beer/wine sampling. Local brewers have outlets in Downtown Albuquerque featuring their brews. Albuquerque also offers many wine tastings and winery tours, Gruet Winery being the most well known and fun tasting room. The condo provides a comfortable atmosphere overlooking the famous Sandia Mountains. It is quiet, spacious, and perfect for a relaxing weekend getaway. My condo is next door to a great green hotel "Andaluz". The ambiance, food and wine is excellent and an easy 2 minuet walk home. My condo can only accommodate one dog pet at a time. The dog pet must be approved by owner. Sorry but no cats. This pet fee is nonrefundable.